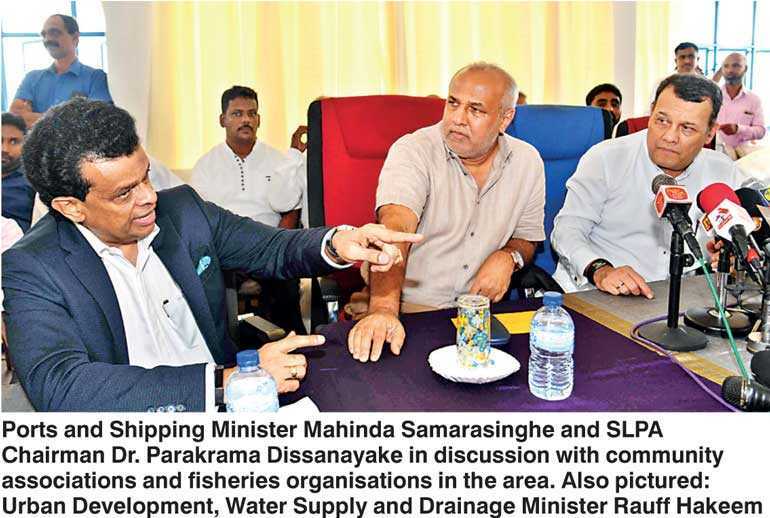 With the initiative ofPorts and Shipping Minister Mahinda Samarasinghe, and the participation of Sri Lanka Ports Authority (SLPA) Chairman Dr. Parakrama Dissanayake, a special discussion was held recently with the fisheries organisations and several community associations of Oluvil in Ampara District. The discussion wasaimed at expediting theprocess ofre-functioning of the Port of Oluvil, which has been obstructed with continued and excessive sand and silt gathering in the approach channel and the port basin.Urban Development, Water Supply and Drainage Minister Rauff Hakeem also attended the event. A number of higher officials of the Senior Management of Sri Lanka Ports Authority (SLPA) also attended the discussion.